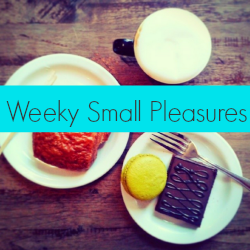 The weeks seem to fly by and it’s already time for another post for the blog event Weekly Small Pleasures, where you describe some of the moments you enjoyed during the week. It’s probably going to make a nice life-in-Berlin photo diary for us to look back on one day! – The days are long at the moment, which means a lot more time after work to enjoy ourselves outside. Other Berliners are doing the same, sitting at cafes, restaurants, beer gardens and in parks. It’s nice just to stroll around and look at the street life. We took one walk through Mauerpark, which has a long cobblestone path lined with poplars, that somehow reminds me of the Appian Way in Rome as we used to see it in school textbooks. At the moment some lovely purple wildflowers are out. – J normally drags me away from the chocolate aisle, so imagine my surprise when he suddenly appeared at my side in the supermarket holding a giant box of Merci. Turns out there was a huge box at a discounted price too good to resist. The little bars of chocolate filled with marzipan, nougat, truffle and so on have made amazing treats the whole week. – One evening after work when I did not have German class, we decided to go to Prater biergarten (beer garden) in Kastanienalle. Since it was a warm night it was crowded and had a good atmosphere. We enjoyed sitting there relaxing with some beer and sausage. After one “real” beer (a Pils) I opted for Berliner Weisse flavoured with raspberry syrup, a Berlin speciality which also comes in a green variant, which is flavoured with Waldmeistersirup. – On Friday since it was a beautiful evening, we decided to go to the Freiluftkino (open air cinema/kino). Somehow no matter how warm it seems at the beginning of the evening, I always end up freezing at the open air kino, so these days I go prepared with a fleece jacket. I like the open air kino in Kreuzberg because they show original version movies, i.e. not dubbed into German as in most places. It’s always a treat to watch something in English. We watched “The Theory of Everything” about Stephen Hawking. It was a good movie, a bit sad, but worth seeing to get a bit of insight into the personality of one of the famous minds. Before the movie we stopped at one of the better döner / schwarma places around. I’m not a huge döner fan as sometimes the meat is not so good, but this one with chicken was quite tasty. – On Saturday we set off on a hot and humid day for strawberry picking at the Berliner Beerengarten near Hoppegarten. The clouds loomed darker and darker and sure enough, just as we arrived it started raining. We decided to pick strawberries nevertheless, and actually it was quite nice to be rained on, since it was such a warm day. You can eat strawberries while you are picking and then afterwards you pay for the ones you have picked by weight. The strawberries were without a doubt the most delicious I’ve ever tasted, full of fragrant sweetness. As they were, they were just perfect, no need for sugar, cream or anything else. But they definitely tasted better when freshly plucked. In between writing this I am busy making a strawberry shortcake with what is left of them. – On Saturday night was the “Lange Nacht der Wissenschaften” (Long Night of Science). In this event many institutes around Berlin host events; one ticket gets you in everywhere, but it’s wise to check out the program in advance as you’ll only have time to see a tiny fraction of the places that are open. We checked out the lab tour at my institute so that J could see where I work. My institute also hosts a fun labwork event for kids (so cute to see them working in their tiny labcoats). Afterwards we headed to one of the Humboldt university buildings for some language classes. They offered fun 30 minute introductions to languages – we ended up staying for Persian, Kikuyu (a Kenyan language) and Kazakh language from Kazakhstan. Then we wandered around the rest of the building looking at some displays on virtual reality and archaeology. It was fun to learn some new things, and I only wish the Long night of science was longer! – Finally on Sunday was one of the real highlights, a trip to Darss peninsula on the Baltic for a walk by the Baltic sea. It was a sea with real waves, not calm like the other beaches I’ve been to so far in Germany. It’s always great to walk with your feet in the cool water, listen to the crashing of the waves and fill your lungs with fresh sea air. Overall a busy but good week! What made you happy in the last week? You had like a dream week for me! Chocolate, berry picking, outdoor cinema, beer garden… Sounds like such a pleasant week. Have a great new week! Thanks! Enjoy your week too 🙂 I am hoping for a relaxing one actually as a bit tired!